The end of 2017 is near, which means it is time for annual year-end “best of” lists to pop up everywhere. 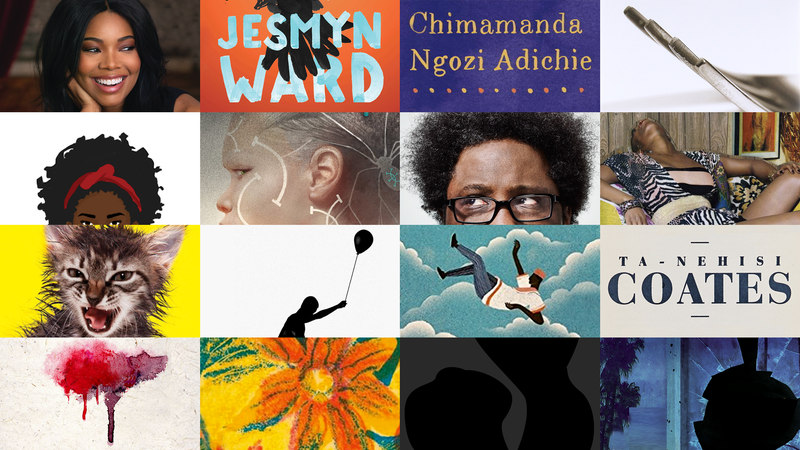 Here, The Root presents our annual list of the most compelling books published in 2017 by black authors in affordable, regular print runs—which is why Beyoncé’s $300 literary opus on the making of Lemonade that dropped this August does not make the list. What will make your Christmas list? A recent National Book Award in fiction for her second novel makes Jesmyn Ward the first woman to win the major honor twice. “I like to think I know what death is,” Ward begins in Sing, Unburied, Sing. “I like to think it’s something I could look at straight.” Here, Ward again mines the rich territory of her Southern upbringing to construct an epic Faulknerian tale. In Hunger, Roxane Gay, best known for her essays and cultural criticism, explores the formation of self in relation to trauma and the world around us. “This story is not about triumph,” Gay writes in the opening of her book. “Mine is not a success story. Mine is, simply, a true story.” It is about living with, and how we live with the aftermath of, the many types of violence done to our minds and bodies. A haunting, lyrical read. The author of over a dozen novels, Nigerian sci-fi/fantasy legend Nnedi Okorafor released this second offering in her Akata Witch sci-fi series this fall. Okorafor, next set to write an arc of the Black Panther comic for Marvel, most recently had her postapocalyptic novel Who Fears Death optioned by HBO. This second full-length collection from Danez Smith, an acclaimed poetry-slam champion who has won virtually every award for young poets, explores blackness, masculinity and gender. It includes Smith’s famed poems “summer, somewhere” and “dinosaurs in the hood”—the former, a portrayal of a pastoral heaven created for slain black boys; the latter calling for films to affirm the lives of black children. This little book from a literary superstar slipped quietly into 2017 but is one of the most delightful reads of the year. Here, Chimamanda Ngozi Adichie’s customary, elegantly clear, profound prose is couched in the form of a letter to a friend who requests advice on how to raise a feminist daughter. Perfect for any young, as well as grown-up, girls you know. Acclaimed actor and director Gabrielle Union, best known for her performance in the title role of Being Mary Jane, has penned a memoir whose title, of course, evokes one of Mary Jane’s famed catchphrases. Here, Union reveals that her hilarious wit and insightful observations on life are not just part of her acting acumen but translate to the written page, too. What We Lose was heralded as one of the best books of the year, and in this debut novel by writer and editor Zinzi Clemmons, a young woman of South African and American descent reckons with the death of her mother. Here, Clemmons, herself born to a South African mother, reckons masterfully with themes of loss, identity and home. This debut short-story collection from Nigerian-American writer Lesley Nneka Arimah sings with effortless energy. Ranging from locales in Nigeria to the United States, from realism to fantasy, these 12 stories showcase the deep range of Arimah’s talent. One of the most eagerly anticipated releases of the year, this debut young-adult novel by Angie Thomas does not disappoint. It is the story of Starr, a young girl who becomes an activist after her best friend’s death. The prolific poet, writer and educator published his latest poetry collection in early 2017. Dawes’ poems are electric, resonating with controlled energy. Also released this year was New-Generation African Poets: A Chapbook Box Set (Nne), Dawes’ annual anthology of new work by contemporary African poets, co-edited with Chris Abani. Rising star Morgan Parker’s second collection of poetry embodies a deceptive chaos, a controlled sophistication. Parker, a former editor for Amazon.com’s literary imprint Day One, crafts poems such as “13 Ways of Looking at a Black Girl,” a splatter-collage of words functioning much like a Jackson Pollock or Pablo Picasso painting. The hilarious Samantha Irby releases her third essay collection, and her words only get more humorous and insightful with each installment. The opening salvo, written in the form of a Bachelorette application, is one not to miss. This is the fourth addition to Hall’s Elouise Norton series, featuring Rachel Howzell Hall’s Los Angeles-based detective. Here, Hall flexes her increasing range in the hard-boiled detective genre, a must-read for fans of crime thrillers. A modern, witty take on race, labels and self-definition, this third novel by Danzy Senna profoundly articulates the contemporary anxiety of identity. In this nuanced yet humorous portrayal of a relationship between contemporary New Yorkers, Senna crafts an entertaining, thoughtful read. Comedian and TV personality W. Kamau Bell offers his own awkward thoughts in response to Issa Rae’s insecure ones. Here, Bell riffs on everything from family, parenthood, education and present-day social issues. A bright light in the world of comedy.